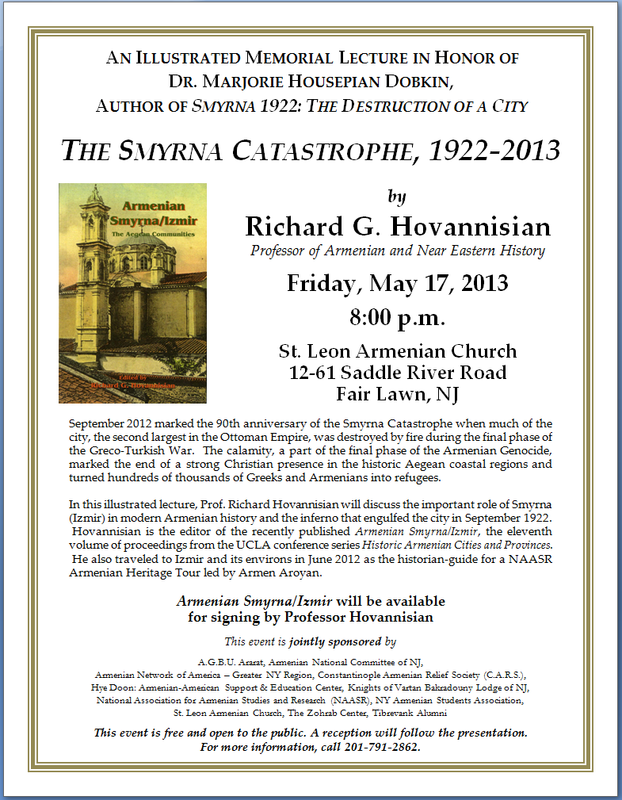 The Zohrab Center is joining a number of Armenian organizations to co-sponsor a lecture by Professor Richard Hovanissian entitled, “The Smyrna Catastrophe 1922-1923.” The lecture will take place on Friday, May 17, 2013 at 8:00PM at St. Leon Armenian Church, Fair Lawn, NJ. The lecture is in memory of Dr. Marjorie Hovsepian Dobkin, author of the landmark study, Smyrna 1922: The Destruction of a City. In September 1922 Smyrna, the second-largest city in the Ottoman Empire, was destroyed by fire during the final phase of the Greco-Turkish War. The destruction of the city marked the end of a strong Christian presence in the historic Aegean coastal regions and turned hundreds of thousands of Greeks and Armenians into refugees. In this illustrated lecture, Dr. Hovanissian, Professor of Armenian and Near Eastern History at UCLA, will discuss the important role of Smyrna (Izmir) in modern Armenian history and the inferno that engulfed the city in 1922. Hovanissian is the editor of the recently published, Armenian Smyrna/Izmir, the eleventh volume of proceedings from the UCLA conference series, “Historic Armenian Cities and Provinces.” This book will be available for purchase and signing by the editor. The evening is being jointly sponsored by the A.G.B.U., Armenian National Committee of N.J., Armenian Network of America-Greater NY Region, Constantinopolitan Armenian Relief Society, Hye Doon: Armenian-American Support & Education Center, Knights of Vartan Bakradouny Lodge of N.J., National Association for Armenian Studies and Research, Armenian Students Association, St. Leon Armenian Armenian Church, and Tibrevank Alumni, in addition to the Zohrab Center. For more information call 201-791-2862.